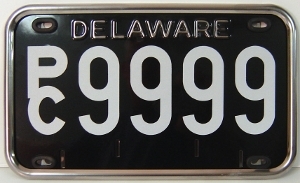 Welcome to the NEW home of The Delaware Historic Plate Company, authorized manufacturer of Delaware Black & White Porcelain and Stainless Steel License Plates, also known locally as Delaware Black Tags - Your source for Black & White Delaware License plates since 1991. IMPORTANT: Please, please take a few minutes to read the Important Information section before you order. It has all the information necessary to purchase your Authentic Black & White Porcelain or new Stainless Steel Reproduction Delaware License Plate. We are now authorized to make a smaller version of our popular Motorcyle (MC) license plate. These new MC tags are 4"x7", the same size as your state issued blue and gold MC tag. You should have no problems mounting this classic black and white tag to your bike! All of our products are now on display and available for purchase at any State of Delaware Division of Motor Vehicles location. That's right. On your next visit to DMV, check out our products, and inquire whether you too can display a black and white tag on your vehicle! NOW AVAILABLE: We are now authorized to reproduce a historic reproduction Stainless Steel License Plate. Our Stainless Steel Tags have a black background, DELAWARE embossed at the top, with white reflective sheeting on stainless steel riveted numbers. This marks the first time in 50 years that Delaware residents can obtain a stainless steel tag for legal registration. Our license plates are manufactured by Delawareans, for Delawareans! 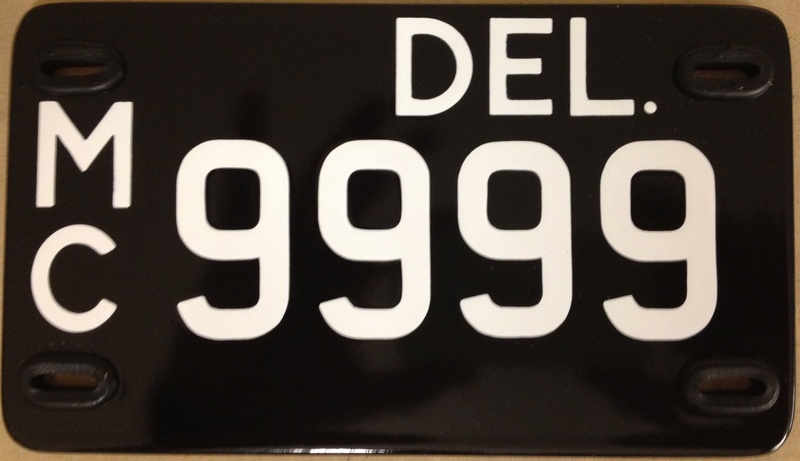 Check out our new Oval Tags, Euro style vanity license plates for the front of your car. We produce oval tags for most Delaware beaches, New Jersey Beaches, and more! Available in the same high quality porcelain enamel as our Delaware Registration plates (with our logo and year enameled on the back! ), or on a high quality aluminum plate. Don't see what you want listed? Contact us and we'll see what we can do!